1. Hungarian Institute of Cardiology. Budapest: Andras Janosi, M.D. 2. University Hospital, Zurich, Switzerland: William Steinbrunn, M.D. 3. University Hospital, Basel, Switzerland: Matthias Pfisterer, M.D. 4. V.A. Medical Center, Long Beach and Cleveland Clinic Foundation: Robert Detrano, M.D., Ph.D.
this date. 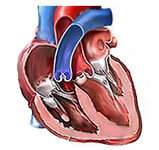 The "goal" field refers to the presence of heart disease in the patient. It is integer valued from 0 (no presence) to 4. Experiments with the Cleveland database have concentrated on simply attempting to distinguish presence (values 1,2,3,4) from absence (value 0). The names and social security numbers of the patients were recently removed from the database, replaced with dummy values. One file has been "processed", that one containing the Cleveland database. All four unprocessed files also exist in this directory. To see Test Costs (donated by Peter Turney), please see the folder "Costs"
Detrano, R., Janosi, A., Steinbrunn, W., Pfisterer, M., Schmid, J., Sandhu, S., Guppy, K., Lee, S., & Froelicher, V. (1989). International application of a new probability algorithm for the diagnosis of coronary artery disease. American Journal of Cardiology, 64,304--310. David W. Aha & Dennis Kibler. "Instance-based prediction of heart-disease presence with the Cleveland database." Gennari, J.H., Langley, P, & Fisher, D. (1989). Models of incremental concept formation. Artificial Intelligence, 40, 11--61. Kaizhu Huang and Haiqin Yang and Irwin King and Michael R. Lyu and Laiwan Chan. Biased Minimax Probability Machine for Medical Diagnosis. AMAI. 2004. [View Context]. David Page and Soumya Ray. Skewing: An Efficient Alternative to Lookahead for Decision Tree Induction. IJCAI. 2003. [View Context]. Yuan Jiang Zhi and Hua Zhou and Zhaoqian Chen. Rule Learning based on Neural Network Ensemble. Proceedings of the International Joint Conference on Neural Networks. 2002. [View Context]. Peter L. Hammer and Alexander Kogan and Bruno Simeone and Sandor Szedm'ak. R u t c o r Research R e p o r t. Rutgers Center for Operations Research Rutgers University. 2001. [View Context]. Rudy Setiono and Wee Kheng Leow. FERNN: An Algorithm for Fast Extraction of Rules from Neural Networks. Appl. Intell, 12. 2000. [View Context]. Iñaki Inza and Pedro Larrañaga and Basilio Sierra and Ramon Etxeberria and Jose Antonio Lozano and Jos Manuel Peña. Representing the behaviour of supervised classification learning algorithms by Bayesian networks. Pattern Recognition Letters, 20. 1999. [View Context]. Yoav Freund and Lorne Mason. The Alternating Decision Tree Learning Algorithm. ICML. 1999. [View Context]. D. Randall Wilson and Roel Martinez. Machine Learning: Proceedings of the Fourteenth International Conference, Morgan. In Fisher. 1997. [View Context]. Pedro Domingos. Control-Sensitive Feature Selection for Lazy Learners. Artif. Intell. Rev, 11. 1997. [View Context]. Ron Kohavi and Dan Sommerfield. Feature Subset Selection Using the Wrapper Method: Overfitting and Dynamic Search Space Topology. KDD. 1995. [View Context]. Wl odzisl/aw Duch and Karol Grudzinski. Search and global minimization in similarity-based methods. Department of Computer Methods, Nicholas Copernicus University. [View Context]. Rudy Setiono and Wee Kheng Leow. Generating rules from trained network using fast pruning. School of Computing National University of Singapore. [View Context]. Chiranjib Bhattacharyya and Pannagadatta K. S and Alexander J. Smola. A Second order Cone Programming Formulation for Classifying Missing Data. Department of Computer Science and Automation Indian Institute of Science. [View Context]. Bruce H. Edmonds. Using Localised `Gossip' to Structure Distributed Learning. Centre for Policy Modelling. [View Context]. Glenn Fung and Sathyakama Sandilya and R. Bharat Rao. Rule extraction from Linear Support Vector Machines. Computer-Aided Diagnosis & Therapy, Siemens Medical Solutions, Inc. [View Context]. Ayhan Demiriz and Kristin P. Bennett and John Shawe and I. Nouretdinov V.. Linear Programming Boosting via Column Generation. Dept. of Decision Sciences and Eng. Systems, Rensselaer Polytechnic Institute. [View Context]. Liping Wei and Russ B. Altman. An Automated System for Generating Comparative Disease Profiles and Making Diagnoses. Section on Medical Informatics Stanford University School of Medicine, MSOB X215. [View Context]. H. -T Lin and C. -J Lin. A Study on Sigmoid Kernels for SVM and the Training of non-PSD Kernels by SMO-type Methods. Department of Computer Science and Information Engineering National Taiwan University. [View Context]. 4. V.A. Medical Center, Long Beach and Cleveland Clinic Foundation:Robert Detrano, M.D., Ph.D.